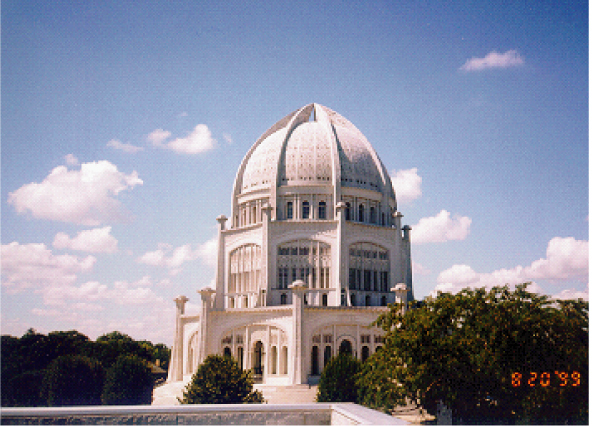 The Bahai Temple is a nine-sided national registered architectural landmark; it is the first precast white quartz aggregate building in the United States. The Bahai Temple, completely surrounded by 100 foot stairs and seven acres of flowered and manicured lawns could not be exposed to any fumes or chemicals without damaging the white quartz. To complete the 200-sq. ft. of roofing, that have over 900 corners, a temporary road was built and a portable crane with over 230 feet of boom was needed. Often, only one man could work in an area because of space limitations. The initial demolition included removing the roofing down to the concrete deck and scraping, cleaning and priming the surfaces. The restoration was completed in December 1984, just a short time before freezing temperatures would make the challenging job even more difficult. The leaks inside the temple have since stopped, preserving it as a place of worship and historical landmark.